UPDATE (9/14/18) – Oren Paris III, former president of Ecclesia College, was sentenced on September 12 to three years in prison for his part in the bribery and kickback scheme described below. He will also have to pay $621,000 in restitution. Paris originally claimed innocence but then bargained with prosecutors for a reduced sentence. In essence, Paris helped to redirect taxpayer funds to state legislators in exchange for some of those funds being diverted to Ecclesia. Last year, I wrote some posts about a bribery case in Arkansas involving a State Senator, a State Representative and the president of Ecclesia College, Oren Paris III. Despite being a small college, Ecclesia has some big names on one of their boards, including David Barton and Eric Metaxas. Initially, Paris and his board proclaimed innocence. However, he eventually pleaded guilty and will be sentenced on September 12. This press release from the Department of Justice’s U.S. Attorney’s Office in the Western District of Arkansas announces a very strong sentence against the State Senator involved Johnathan Woods. Those involved concocted a scheme to secure taxpayer funds through kickbacks and bribes. The press release below provides a good summary of the situation. To get more background see also these posts. Fayetteville, Arkansas – Former Arkansas State Senator Johnathan Woods was sentenced today to 220 months in prison for organizing and leading a bribery scheme in which state funds were directed to non-profit entities in exchange for kickbacks, many of which were funneled through a consultant’s business, announced U.S. Attorney Duane “DAK” Kees for the Western District of Arkansas, Assistant Attorney General Brian A. Benczkowski of the Justice Department’s Criminal Division, FBI Special Agent in Charge Diane Upchurch and IRS Special Agent in Charge Tamera Cantu. On May 3 2018, a jury found Jonathan E. Woods, 41, of Springdale, Arkansas, guilty of 15 counts, including conspiracy, honest services wire and mail fraud, and money laundering. In addition to his prison sentence, U.S. District Judge Timothy L. Brooks of the Western District of Arkansas sentenced Woods to serve three years of supervised release and ordered Woods to pay $1,621,500.00 in restitution. According to the evidence presented at trial, Woods served as an Arkansas State Senator from 2013 to 2017. Between approximately 2013 and approximately 2015, Woods used his official position as a senator to appropriate and direct government money, known as General Improvement Funds (GIF), to two non-profit entities by, among other things, directly authorizing GIF disbursements and advising other Arkansas legislators – including former State Representative Micah Neal, 43, of Springdale, Arkansas – to contribute GIF to the non-profits. Specifically, Woods and Neal authorized and directed the Northwest Arkansas Economic Development District, which was responsible for disbursing the GIF, to award a total of approximately $600,000 in GIF money to the two non-profit entities. The evidence further showed that Woods and Neal received bribes from officials at both non-profits, including Oren Paris III, 50, of Springdale, Arkansas, who was the president of a college. Woods initially facilitated $200,000 of GIF money to the college and later, together with Neal, directed another $200,000 to the college, all in exchange for kickbacks. 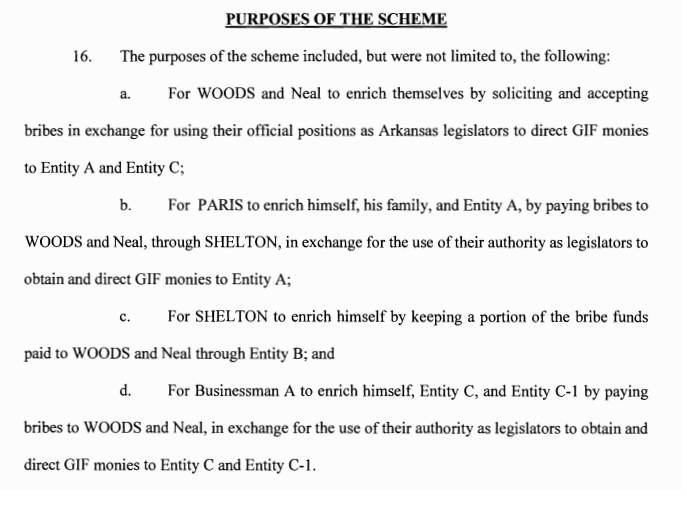 To pay and conceal the kickbacks to Woods and Neal, Paris paid a portion of the GIF to a consulting company controlled by Randell G. Shelton Jr., 39, of Alma, Arkansas. Shelton then kept a portion of the money and paid the other portion to Woods and Neal. Paris also bribed Woods by hiring Woods’s friend to an administrative position at the college. Shelton also was found guilty by a jury on May 3. He was convicted of 12 counts, including conspiracy and honest services wire and mail fraud, and is scheduled to be sentenced on Sept. 6. Paris pleaded guilty on April 5, before Judge Brooks to one count of honest services wire fraud, and he is scheduled to be sentenced on Sept. 12. Neal pleaded guilty on Jan. 4, 2017, before Judge Brooks to one count of conspiracy to commit honest services fraud, and he is scheduled to be sentenced on Sept. 13. The FBI and IRS Criminal Investigation investigated the case. Trial Attorney Sean F. Mulryne of the Criminal Division’s Public Integrity Section and First Assistant U.S. Attorney Kenneth Elser and Assistant U.S. Attorneys Kyra Jenner and Aaron Jennen of the Western District of Arkansas prosecuted the case. Incidentally, Judge Brooks is also the presiding judge in the Gospel for Asia case. Earlier today, popular Christian author Eric Metaxas posted on the Ecclesia College Facebook page and tweeted his support for embattled Ecclesia College president Oren Paris III. On March 2, Paris was indicted for fraud in connection with a kickback scheme which had already taken down an Arkansas state representative. In January, Micah Neal pleaded guilty to fraud and allegedly accepting bribes from Paris. Despite Rep. Neal’s admission of guilt, Paris has repeatedly denied any wrong doing. Praying for Oren Paris and the Ecclesia Family. They are some of the most honorable people I know, so expecting great things in the end! Metaxas is listed on the Ecclesia College website as a member of the Board of Regents. Although three members of the Board of Regents didn’t even know they were on the board, apparently Metaxas has embraced Paris and the college. Read the indictment of Paris and State Senator Jon Woods here. According to the indictement, Paris sought to enrich himself, his family and Ecclesia College by paying bribes to Sen. Woods and Rep. Neal. In exchange for the kickback payments, those legislators agreed to funnel state discretionary funds to Ecclesia College. Steve Henderson, H.D. McCarty and Pat Boone are listed by Ecclesia College as members of their Board of Regents. However, the men now say they didn’t know they were listed as members. Pat Boone told Arkansas Democrat-Gazette reporter Bill Bowden he never heard of the school. Henderson and McCarty both know about the school and know beleaguered president Oren Paris but they didn’t know they were on the Ecclesia Board. Paris has been indicted on charges of fraud for his part in an alleged kickback scheme including two Arkansas state legislators, Sen. Jon Woods, and Rep. Micah Neal. Neal has already pleaded guilty and is awaiting sentencing. Woods and Paris maintain their innocence. If the leadership of the school would mislead the public about something as important as who is on the Board of Regents, it does make me wonder what else they aren’t being honest about. The other shoe dropped today. After Arkansas state representative Micah Neal was indicted for his part in a kickback scheme involving Western Arkansas non-profits, including Ecclesia College, speculation mounted that state senator Jon Woods would also be indicted. The fate of others mentioned in the Neal indictment was not as clear. However, today a federal grand jury released indictments of Woods, Ecclesia College president Oren Paris III and their mutual friend Randell Shelton, Jr. 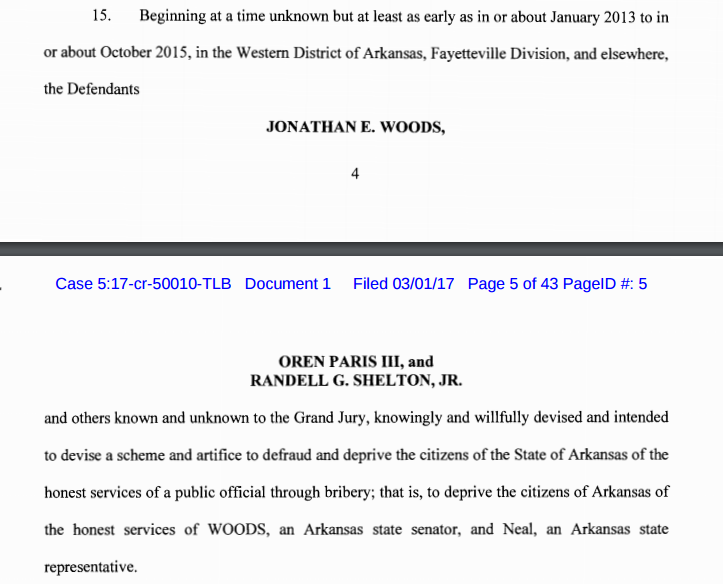 According to the indictment, Neal, Woods, Shelton and Paris conspired to defraud the citizens of Arkansas. The indictment spells out in detail the communications between Paris, Wood and Shelton. 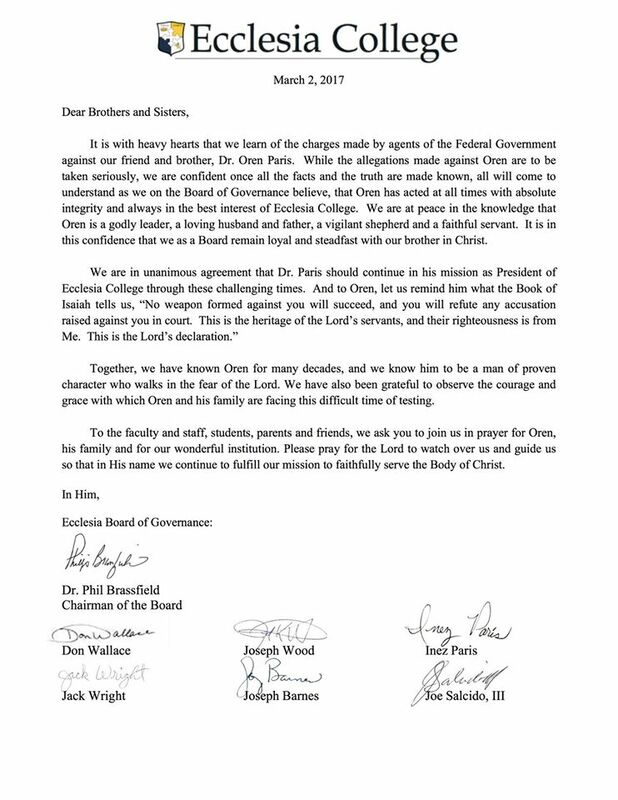 Despite the indictment, Ecclesia’s board is standing by their man. A couple of hours ago, the college posted the following letter on their Facebook page. Ecclesia College also lists a Board of Regents with notable Christians such as Pat Boone, David Barton, and Eric Metaxas. Ecclesia College Ecclesia has previously released a statement regarding the Micah Neal plea agreement and will not be issuing any further statement at this time. You can read the prior statement denying any wrongdoing here. For more on Ecclesia College and the Arkansas bribery scandal, read here, here, here, here, here, and here. I suspect Ecclesia’s attorneys have advised anyone associated with the college not to speak about the matter since there is an ongoing investigation. Arkansas tax dollars in action. Yesterday, Max Brantley at the Arkansas blog posted results of his freedom of information request from the state government. He was able to get emails regarding funds funneled to Ecclesia College as well as the subpoena to the Northwest Arkansas Economic Development District from investigators looking into the Arkansas bribery scandal. The figures add up to $621,000, mostly for property acquisition. 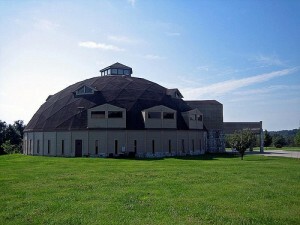 Thus, the taxpayers of Arkansas have helped to purchase land for a church (which the college is according to the IRS). Something seems very wrong about this. In the material Brantley received, it is clear that Oren Paris III, the president of Ecclesia College, is being investigated in some fashion. The subpoena requests all communications and documentation regarding the General Improvement Fund grants. Most likely, Paris and Ecclesia will remain silent about the matter until the investigation is completed. In fact, Ecclesia College is a part of a church called Ecclesia, Inc.
Ecclesia College is an important branch of the Ecclesia Network. Other ministries in the network include Strategic Missions, Ecclesia Relief and Development, Bibles For the Nations, Twila Paris Productions, Ecclesia Children’s Ministries, and Happy Few Unlimited. 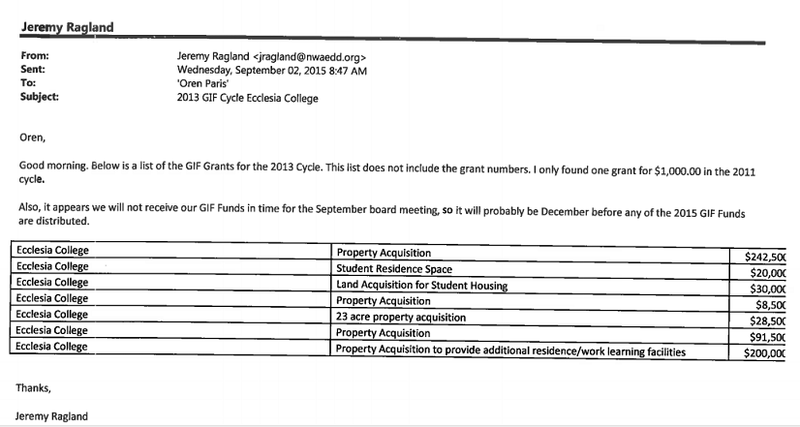 When Micah Neal’s plea agreement says that development funds were directed to a “nonprofit corporation operating a college located in Springdale” the reference is apparently to Ecclesia, Inc. which is a church. If Ecclesia is a church, then who is the pastor? In essence, Arkansas tax payers have spent well over $500,000 since 2013 building a “church” in Springdale, Arkansas via the General Improvement Fund. This church isn’t functioning as a church but appears to be shielding several money making ventures from public accountability and possibly taxation. Last March, the Freedom from Religion Foundation complained to the Northwest Arkansas Economic Development District about the allocation of funds to Ecclesia. According to the FFRF report, a NWAEDD representative pledged not to use any additional funds for religious purposes. While I doubt it will happen, I believe the Arkansas legislature should investigate the funneling of funds to Ecclesia and other religious organizations. Specifically, Ecclesia’s role, if any, in the bribery scandal should be investigated. More generally, Ecclesia’s status as a church appears to be questionable as has been the practice of allocating public funds for sectarian religious purposes. Last week, Arkansas state representative Micah Neal pleaded guilty to fraud and accepting bribes from two non-profits in his district in exchange for state government discretionary funds. One of the non-profits has been identified as Ecclesia College, a Bible college in Springdale, Arkansas. In the plea agreement with Rep. Neal, the president of Ecclesia College — Oren Paris III – is referred to as one of those who authorized payments to Rep. Neal. After this news emerged, Paris issued a statement via Facebook denying any wrongdoing. After Paris posted his denial, I left a comment asking about specific elements of the plea agreement. The agreement claimed Paris (“Person B”) authorized payment of $18,000 to Neal through a consultant (“Person C”). On the Facebook page comment section, I asked about the identity of Person C is and why Ecclesia College paid Person C $65,000 as stated in the plea agreement. According to the agreement, $18,000 was authorized to go to Rep. Neal. Two other commenters also called on Paris to provide more information. As of yesterday, Ecclesia College has removed those comments from their Facebook denial and banned my account from commenting. I heard from one other commenter who is also banned. Instead of addressing what are fair questions based on the plea agreement, Ecclesia removed the comments. It seems likely that additional charges will come in this case and that the questions for Ecclesia will not go away. If there is truly no wrongdoing Ecclesia should be transparent about this deal which involves tax payer funding and a breach of public trust.